An exciting new offer from Oxford University Press: the latest (8th) edition of their Advanced Learner’s Dictionary is now freely available online at oxfordadvancedlearnersdictionary.com. From the box on the left choose which staple you’re interested in – as you can see, some headwords have picture illustrations too (funny though that the image of staple as an office tool is shown for the adjective staple), and you can always listen to the pronunciation in both British and American English, plus you get the phonetic transcriptions. 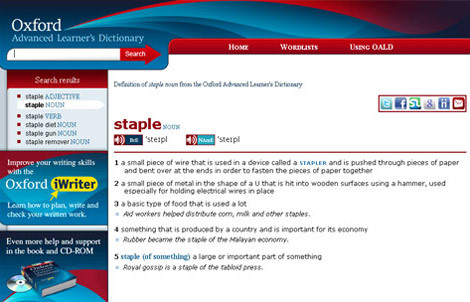 Most (if not all) words come with sample sentences, and when necessary, the definitions are accompanied by a special note; in this case, for staple: “only before noun”. 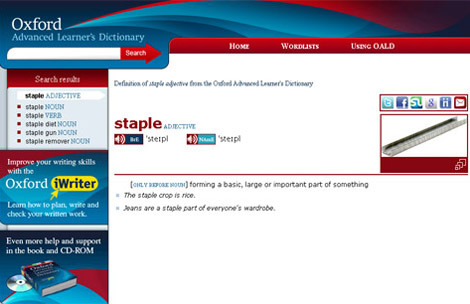 Above is a screenshot of the the staple (noun) page – you pretty much get what you can expect: clear definitions and carefully chosen sample sentences. A very useful feature of the site is the Oxford 3000TM – a list of the most important 3000 words for learners. You can also subscribe to their Word of the Day feed and get a new word in your reader every day. 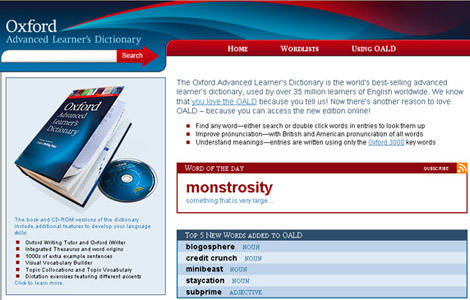 Of course, there is still a lot left out that you will only get if you buy the printed dictionary and its accompanying CD-ROM but you can’t blame Oxford here – this online dictionary is such excellent value that we can only thank them for making it freely accessible. This will be a very subjective and incomplete list of the blog posts I found the best (whatever that means) in 2009. I had no criteria or concept; the list is simply based on my impressions. Please feel free to add your favourite posts in the comments section. A truly inspiring list – could apply to all teachers. A thoughtful and thought-provoking piece on a recent debate sparked by Gavin Dudeney here on egos and much more. An excellent rebuttal to those opposing the use of technology in ELT – brilliantly argued. Scott’s first post on his new blog, and what a way to start! Also, make sure you read the comments too – they’re as valuable as the original piece itself, as is often the case with great posts. I can only repeat what I read in the comments: a touching post. TamÃ¡s keeps on coming up with touching posts. Once again, Gavin takes a critical look at some false assumptions on the use of ICT in ELT. And once again, read the comments by all means – isn’t it interesting that the first negative comment accuses him of making up strawmen? The exact same argument was used against my similar post by a different colleague. The title says it all – thoughts on teaching culture; again, read the comments section as well. OK, this list will have to end here, I’m afraid. It took me well over a day to write this short post because I kept on reading instead of writing (not a bad thing, actually). When I began, I had a vague idea of which posts I wanted to include, but of course I re-read many more, followed links… you know how it goes. So the list remains incomplete and unfair, as there are no posts included from Vicki Hollett, Sara J. Hannam, Stephen Downes, Graham Stanley, Nik Peachey… and many more. Please help remedy this situation and post a link to your favourite ELT blog posts of 2009 in the comments. Your students will need less time and create much better animations too, no doubt. The possibilities are endless – there are so many things you can do with it you actually have to concentrate not to lose focus and get lost while exploring all the options. You can get your students to create stories based on the topic you’re dealing with or use it in any other way, in groups or individually – you can even make it into a competition and they can vote on the best pieces. Just exploring the options and learning to use the site will be useful in itself – they will have a reason to read for information if they’re interested in creating animations. Visit goanimate.com to create an account and create your own stuff. I only have one slight misgiving about the site: they use pretty heavy marketing tactics to promote themselves – but, hey, they have to make a living.